Does Blatter’s departure threaten Russia’s 2018 World Cup? FIFA President Sepp Blatter suddenly announced he would step down as head of the world’s soccer governing body, days after he was re-elected to the post, sending the ‘beautiful game’s’ administration into a churn. Russian sports authorities were caught by surprise but they are confident that the 2018 World Cup will be held in Russia, as planned, despite the FBI and Swiss investigators widening the scope of the probe into corruption at top levels of the FIFA. Joseph “Sepp” Blatter’s surprising decision to announce his resignation from the world soccer governing body’s top post, in a hurriedly convened press conference on June 2, barely four days after he was re-elected as FIFA president, caught Russian sports authorities by surprise. They linked Blatter’s departure with pressure on him to step down as US investigators found key members of the FIFA executive committee involved in a burgeoning corruption scandal that has plagued the ‘beautiful game’s’ international governing body. Commenting on the shock resignation, Russian Sports Minister Vitaly Mutko told the R-Sport agency that FIFA's president had “made a courageous decision, with love for FIFA." Mutko also said that, "certainly for many federations, as for the whole football family itself, this was an unexpected decision," linking it to the calls for Blatter to stand down on the eve of the annual FIFA Congress, which took place at the end of last week in Zurich, over a vast corruption scandal that has seen 14 senior FIFA officials charged with racketeering, fraud and money laundering in schemes involving a total of $150 million. Shortly after Blatter’s announcement came reports that Blatter himself was also under scrutiny by the FBI and the U.S. Justice Ministry. Despite the unexpected resignation, Russian sports authorities appeared confident that there are no reasons to review the decision to award Russia rights to hold the 2018 World Cup, a decision that had Blatter’s backing. A few days before the congress, on May 27, seven high-ranking FIFA officials were arrested on corruption charges by Swiss police at the request of the U.S., in whose jurisdiction the crimes allegedly took place. A further seven senior officials from the body were charged shortly afterward, bringing the total of those currently under investigation to 14. Joseph Blatter, who has been president of FIFA since 1998 and was re-elected to a fifth term on May 29, unexpectedly announced his decision to resign at a press conference on the evening of June 2. “I do not feel that I have a mandate from the entire world of football,” said Blatter, explaining his decision. He will divest himself of authority at an extraordinary FIFA congress to be held between December 2015 and March 2016. However, soon after Blatter announced that he was quitting, Greg Dyke, chairman of England's football association, said that the issue of where the 2018 and 2022 World Cups will be held (Qatar is hosting the 2022 championship) could be reviewed. Speaking about the World Cup in Russia in an interview with the state TV channel Rossiya 24, Mutko said that "the decision was not made by one person, but by the executive committee. There are no threats (to the championship being held in Russia)." Vyacheslav Koloskov, honorary president of the Russian Football Association and former FIFA and UEFA executive committee member, is of the same opinion. In an interview with the Sport Express newspaper, he stated that “even now (after Blatter's decision) there are no grounds for moving the 2018 World Cup to another country, for taking it away from Russia." However, there are certainly reasons for concern. 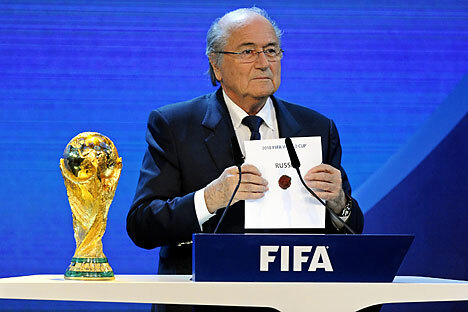 Shortly after the arrests in Zurich on May 27, Swiss police opened a parallel criminal inquiry into the awarding of the 2018 and 2022 World Cups to Russia and Qatar. Allegations of vote-buying have been circulating in global media ever since the announcement of the two hosts in December 2010, with the award of the event to Qatar provoking widespread ridicule. And late on June 3 Reuters reported that the FBI is also to look into the 2018 and 2022 bids as part of an extensive probe into corruption in FIFA beyond the initial indictments. Despite these worrying developments, Russian soccer insiders do not see any immediate threats to Russia's hosting of the next World Cup. Former head of FIFA's Moscow bureau Valery Chukhry underlined that the decision to have Russia host the 2018 World Cup was made on a collective basis, by FIFA's executive committee and not by Blatter alone. For now Chukhry does not see any grounds for depriving Russia of the championship. At the same time observers say that the situation could become more complex if in the course of the investigation officials uncover information that compromises Russia. "Pandora's box has been opened,” said Dmitry Navosh, general director of the sport.ru website, who added that there will be information on FIFA corruption that may include Russia. However, Navosh stressed that even serious evidence of corruption among Russian FIFA officials would not mean that the decisions made earlier will automatically be revoked. Valery Chukhry also said that Blatter will remain president for almost a year and even if FIFA decided to take the championship away from Russia, it will have very little time to organize it in a different country.